GB Tell me why you chose the vase. RC I think when you first mentioned the project I wanted to choose something that wasn’t primarily visual. Can someone blind from birth have a sense of beauty? Beauty can come to you through the other four senses: sound, taste – and in this case I’ve chosen something tactile. I relate to this more as something I can hold than I do through my eyes. It has a bosomy quality that I like very much. I love the surface patina but most of all I like to hold it. It has a wonderful sort of rightness to it. GB That’s great. A lot of people with Bernard Leach pots wouldn’t dare to pick them up! RC Well that’s another thing I like about it. There’s none of that preciousness. It’s utilitarian and functional – although I’ve never put flowers in it or filled it with wine. But it’s hardy to the point that I think it would be useful to smash over the head of a burglar. It’s very hard and stony and would certainly knock him out, if not kill him. Then I could put it back and it would sit there smugly. GB I bet Bernard Leach would love that. He wanted to make utilitarian pieces. RC I love that it has this sort of scab on it, this bit of roughness that gives it identity. He could have smoothed it off but he didn’t. GB Do you think he was aiming for beauty in his work? RC Isn’t it that 20th century idea of form following function? The practicality of it makes it beautiful. GB Do you think he found beauty in his Eastern influences? RC Well that’s another interesting thing about this pot. It’s not so much Eastern as Mediterranean or Aegean. Even Biblical. I don’t know when it dates from. GB Which seems to go against those democratic principles as it makes it a work of art rather than anonymous craft. RC Yes. If you’d never told me it was Bernard Leach I’d still think it was a nice pot. 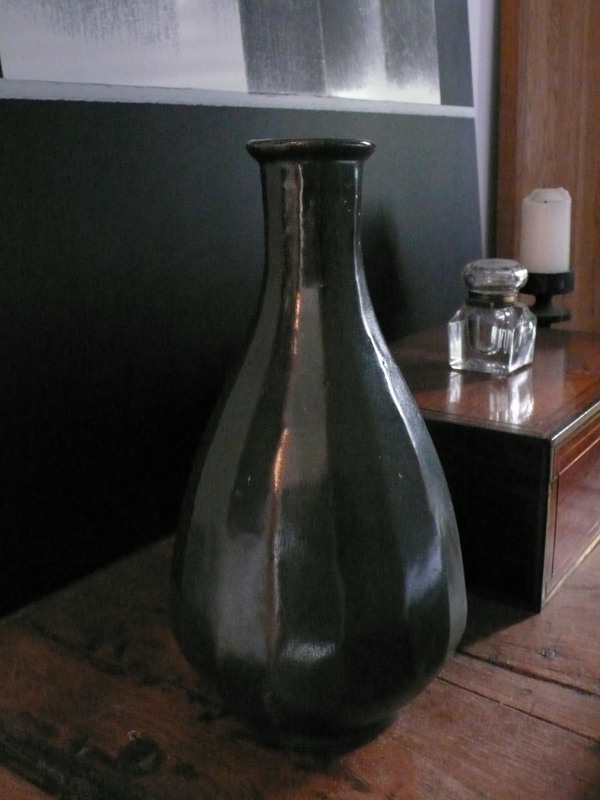 My partner bought it on eBay, I think from Bernard Leach’s grandson. It arrived in a box in the post. If I look at it though, it’s not the shape that pleases me so much, rather the feel that makes it beautiful. It sits so comfortably in your hands. I hate not being able to stroke sculpture. I often have the urge when I’m in an art gallery, to stroke a painting or even kiss it. I want tactile contact. It always happens with the Van Eyck Marriage of Arnolfini. GB Do you think that painting has a universal beauty? RC No, I don’t believe in universal beauty. RC I use the word too much, while my partner who writes about architecture never uses it and thinks it’s not critically valid. For me there has to be some disinterested form, something that’s not about the artist’s ego but is about some sort of absolute – which can be as simple as a curve or a straight line. I love Greek pillars because they’re straight but also slightly curved. It disturbs me that so much contemporary art is wilfully ugly. That disqualifies it as art for me.